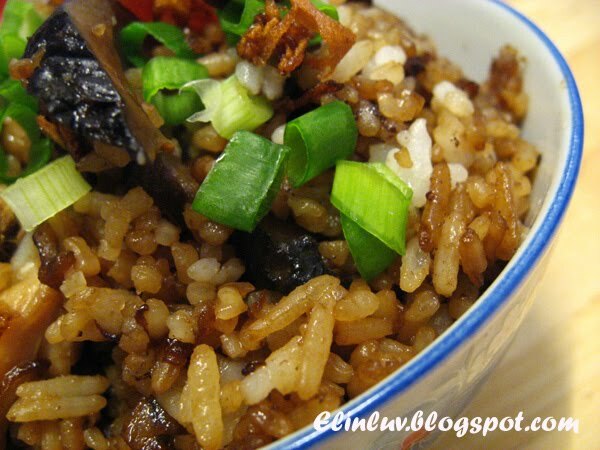 This is the modern , fast and easy to prepare " claypot rice " that I cooked in a electric rice pot that taste as good as the authentic ones. A one dish meal that I would love to indulge in once in a while. The real claypot rice uses a clay pot and cooked under charcoal fire. Of course the taste is slightly different, somehow charcoal cooking makes the rice taste better . But for lazy people like me, rice pot chicken rice is just as good. I did the shortcut method and yet it tasted delicious :p But if I wanted the authentic one I would eat out at the Gourmet Square...the true claypot rice cooked under charcoal fire. The authentic way is to cook the rice half way through, then add the marinated chicken pieces , sausages and mushrooms on top of the half cooked rice. Cover the claypot and lower the fire and cooked till everything is fully cooked. Off the fire, then mix everything in the claypot with a pair of chopstick and served garnish with the crispy shallots and spring onions. when I served this to Daddy, he doesn't know that I did it the short cut way ! *wink ** someone got tricked after all LOL! Cook rice the usual way in an electric rice cooker. While the rice is cooking, heat up a non stick wok with grapeseed oil enough to fry the cut shallots till crispy and golden brown, dish up and keep aside. Take out the oil and keep about 2 tbsp of oil in the wok and stir fry the chinese sausages till fragrant, add in the shiitake mushrooms and cook till half cook, add in the marinated chicken and stir fry till it is fully cooked. 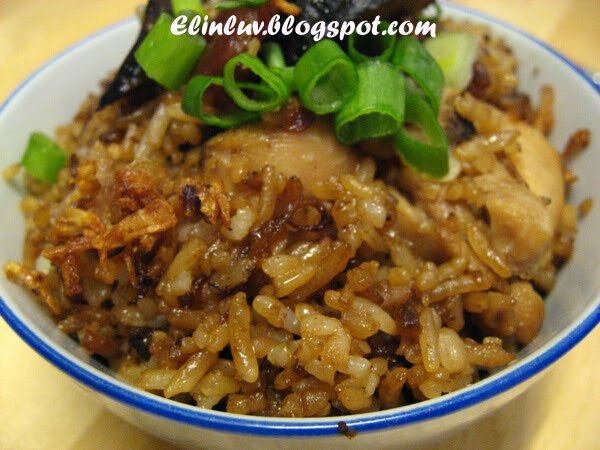 Dish up into a bowl and when the rice is fully cooked and still hot, add in the cooked chicken mixture on top of the cooked rice. 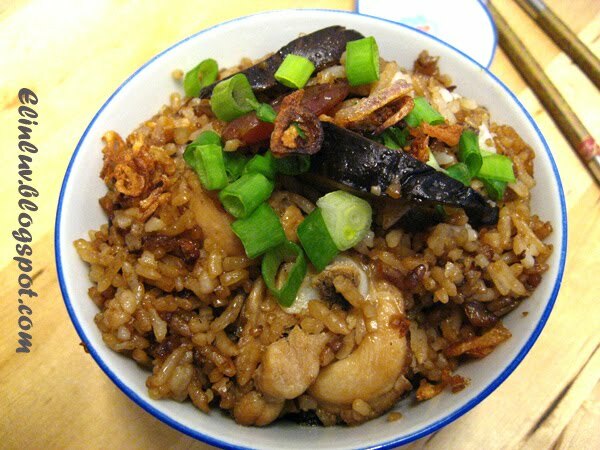 When about to serve, use a pair of chopstick and stir and mix well the chicken mixture with the rice until it is well mixed together. Garnish with spring onions and crispy shallots. 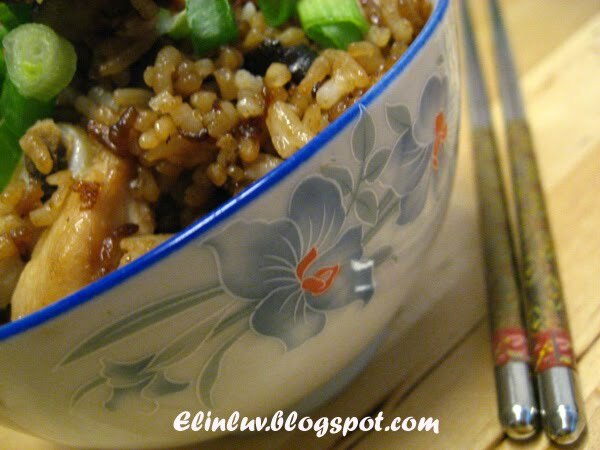 I make this rice cooker chicken rice quite often too. Boil a veggie soup, and that's dinner! Love love love claypot chicken. My favorite was this one I got at a Malaysian street vendor - a huge pot for like $2! I have yet to recreate, but I just might try with this one. Oh, I think I also want to join in Angie's potluck party. haha... So, what should I bring? I love claypot chicken rice very much too. Yours look simply delish! Enjoy your day. Lovely work, Elin! Keep it up! I'm sure Joanna is missing your yummy creations! It's not good to drool everyday! LOL! Dinner in one path is always appealing. Thanks for a great post. 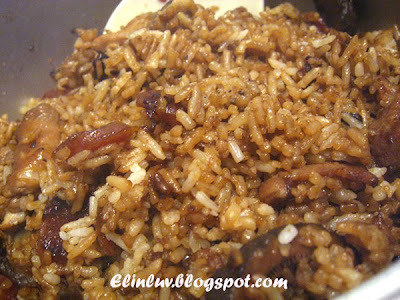 Thanks for the tip on cooking rice half through before adding the flavorful ingredients. Must soak up all the flavors! Wah, I want to try this simple method, will make it next week. Thanks for sharing! That looks delicious! Reminds me of when I was at home and mum or dad would cook "law-miy fahn" (糯米飯) for weekend lunch and we'd have blanched iceberg lettuce with oyster sauce to go with it! Mmmmmm! Missing parent's cooking! Might have to make this for lunch soon! Wow how simple to make. But it sure sounds and looks like it taste amazing. Me too! Always go for fast and lazy method when comes to cooking. Must try your fast method one day. I cook mine in the rice cooker too when I'm lacking inspiration. Your version looks delicious! Sorry, I remembered the name wrong! They would call it "Lap-Mei Fahn" (蠟味飯) as it would have the chinese dried sausage,chinese dried belly pork, shiitake mushrooms, dried scallop, dried prawn, all kinds of dried seafood delights! It would make the kitchen smell all rich and savoury with the scent of the seafood goodness! YUM! ya, I like this easy way of claypot chicken too, yours look so delicious, can I have some please.. I just made this today! I cook this very often. So simple and so delicious! Elin, I cook this too. Very easy to cook, but it's really yummy! Hi guys.....sorry for not replying your comments earlier...fallen sick due to over eating of durians :p I am feeling much better now but still feeling lethargy :( thanks for leaving me your kinds words. I love all your comments...all are like sweet candies to me . Thank you. Marvelous chicken dish. Bravo! I really enjoy claypot cooking. I love claypot chicken. We would always get it when we ate out. Thank you for sharing.